If you are looking for a white flowering native pant then Ozothamnus diosmifolius or ‘Rice Flower’ is certainly one to consider. 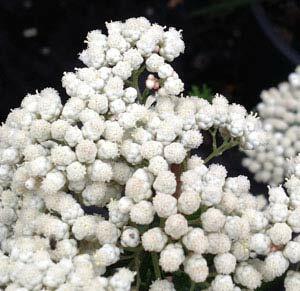 Glowing white flowers appear atop the stems which are held upright. You will also find a pink flowering variety named ‘Just Blush’, it grows in the same conditions. Although a number of Ozothamnus species are available, the genus is probably best known for Ozothamnus diosmifolius (pictured right) which is known as the ‘Rice Flower’ and is valued in the cut flower trade around the world for its flowers. The small white flowers that do look like grains of rice appear in large clusters, a few cultivars are available said to have a more compact habit than the species. Reaching around 1.5 m to 2 metres in height, the Rice Flowers makes an excellent addition to the garden border. The flowers are excellent for cutting as well. Two main types are used for cut flowers however it the narrow leaf variety that is more popular. Excellent garden plants although they are subject to problems if nematodes are present in the soil. Propagation is generally from stem cuttings. All species require a well drained soil and although they do require some moisture during early stages of growth, once established watering is not generally required. Flowering and overall growth will be better where the soil is moist, however this is a plant that copes with hot dry summers with the occasional deep watering. For better flower production, tip prune by pinching out new growth, this also maintains a more compact growth habit. These are long flowering shrub with masses of flowers though most of the year. A well drained position in full sun to part shade is best. The best time to prune is immediately after flowering. Plants can be pruned back reasonably hard each year if required. Do not prune back into old wood as stems may not reshoot. 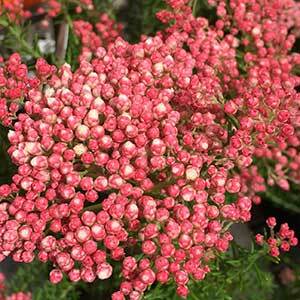 Pink flowering varieties are also available. With over 50 species some others to consider are Ozothamnus ferrugineu, Ozothamnus cordatus, and Ozothamnus obcordatus. Height – Will reach from 1.5 to 2 metres in height. Flowers – Pink to white depending on variety. Frost tolerant – Moderate frosts only.